Beretta® M9A1 9mm Semi-automatic Handgun. Based on the battle-proven and tested M9, but enhanced with input from military and law enforcement agencies from around the world. The Beretta M9A1 was developed to meet the demanding requirements of the U.S. Marine Corps, but with incredible accuracy, durability and versatility, it's also an ideal home defense gun. Because if the U.S. Marines trust it in battle, surely you'll want it on your side. Packed with features like an integral Picatinny rail, low recoil, and incredibly simple maintenance, the Beretta M9A1 is sure to meet the demands of the most demanding shooters. Combat trigger guard is optimized for the best off-hand placement and ease of reholstering. 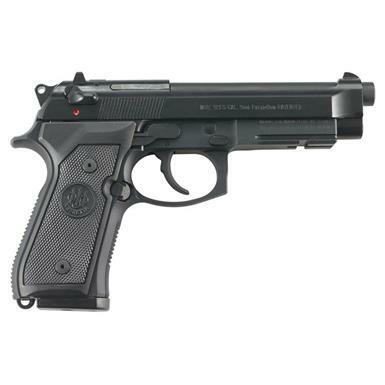 Beretta M9A1, Semi-automatic, 9mm, 4.9 Barrel, 15 Round Capacity is rated 5.0 out of 5 by 1. Rated 5 out of 5 by Wisdom Wolf 777 from I love the M9A1. Will be buying 2 more of these from sportsman's guide soon. This is a excellent quality handgun very accurate comes with 2 magazines.